Bloody Monday, not a day in some insurrection against an invading power, or a day that the Stock Market crashed. This is about the Battle of Borodino. Borodino is a city that is right on the direct route in Russia from Smolensk to Moscow. In both 1812 and 1941, titanic battles took place there to decide the fate of Russia. In 1812, Napoleon invaded Russia to put a seal on his conquest of Europe, and to force England to its knees through the Continental System (The Continental System was thought up by Napoleon to force all of Europe to stop trading with England). The Russians had been backpedaling since the beginning of the campaign. This strategy was put in place by the 'Fox of The North', Marshal Kutuzov. He wanted to harass Napoleon, and let the breadth of Russia and its weather destroy him. Some other generals in the Russian army did not want to give up Moscow without a fight, and forced Kutuzov to stand at Borodino. Napoleon was approached by Marshal Davout about attacking the Russians from their flank, but Napoleon would not even think about it. He was too worried that the Russians would escape him once again. 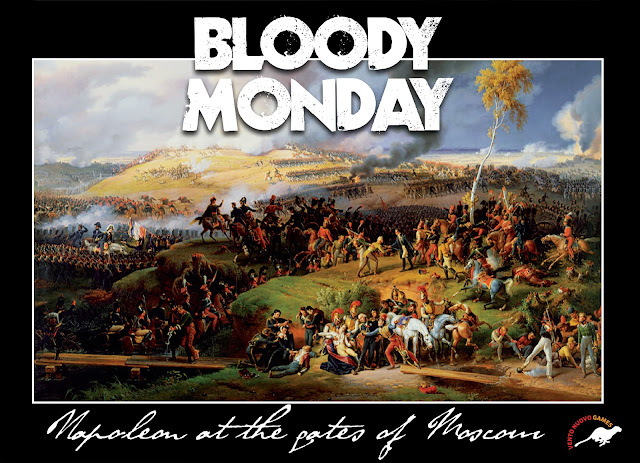 So the stage was set for the bloodiest day of the Napoleonic Wars. Much like Waterloo, it was a straight up slug fest between the combatants. Between the two armies, 250,000 men fought and suffered 70,000 casualties. The other victory conditions are that you control all seven victory areas, or eliminate ten enemy blocks (Russian Militia, Jaegers, and Cossacks do not count toward destroyed units). The units are divided into 'fast' and 'slow'. Fast units are Cavalry, Horse Artillery, Tactical Leaders, and Supreme Commanders. These all have a movement allowance of five. 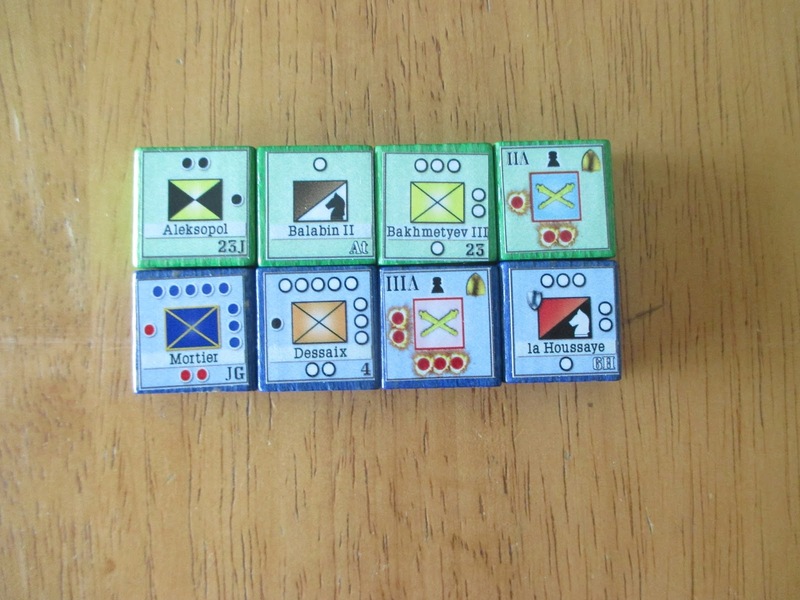 Slow units are infantry and Foot Artillery, and these have a movement allowance of three. As usual, the units have their current strength points at the top of the block in the 12:00 position. 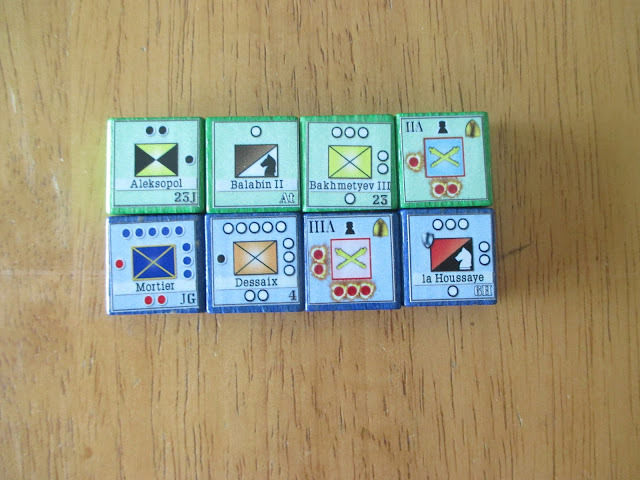 Losses to the unit will involve flipping the block counter-clockwise one side. In the Logistics Phase, both the players may call for reinforcements, restore artillery, tactical leaders and Combat Units. During the Impulse Phase, players take turns performing single impulse actions (a tactical Action, a Pass, or a Initiative action). The Impulse Phase ends after two consecutive Passes. During the Initiative Action (which can only be done if the phasing player has and spends the initiative Disc) the Phasing Player may move his Units and resolve battles without activating any Tactical leader. During a Pass, the Phasing Player may move only one of his units. The Final Phase is just moving the Turn Track marker forward one space to the next turn. Besides being able to be destroyed, the Supreme Commander's Unit has a few other interesting design choices. Both Supreme Commanders can only be activated a maximum of three times, and the actual block has to be turned over so that the enemy can see where it is located if it is activated. Without activating your Supreme Commander, a player cannot call for reinforcements or restore any unit's strength. The logistical value of each Supreme Commander unit is lessened by each time it is activated. The block is flipped one side each turn it is activated. Both Supreme Commanders start with four stars, and these can be used for three turns so that they will become two stars on the third activation. This is a large part of the game because the logistic value is totaled up between the stars on the Supreme Commander, and the number of victory areas its side is in charge of. So you will have to choose wisely when you want to use your Supreme Leader activations. The initiative disc is moved between each player by its use. On turn one, it starts with the French Player. If it is used by them to call for reinforcements etc. it is then expended, and handed to the Russian player until he uses it, and so on. After two consecutive passes, one for each player, that turn ends. As was mentioned, this is a stand up brutal battle. The French player will have to batter and then pry the Russian player from the Raevsky Redoubt and the Fleches. This is not easy, and comes at a high price. As The Russian player, you will have to tenaciously defend and guess when to counterattack. Your job is made a little easier because of the straight forward nature of the French attack. However, you have to deal with the Grande Armee during one of its last hurrahs as a fighting force. 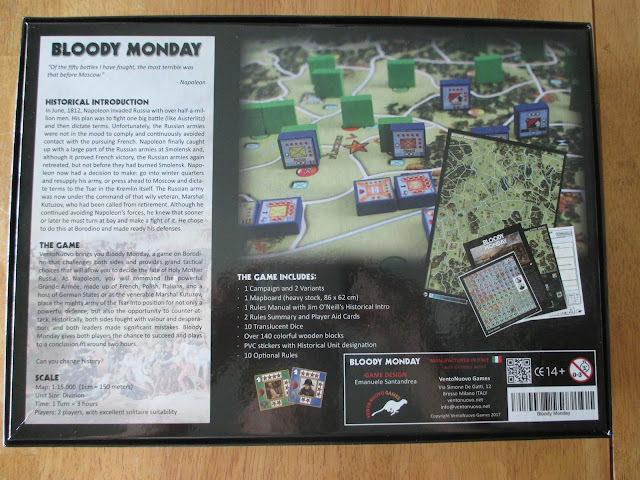 I have five boardgames and a few computer ones that deal with the Battle of Borodino. The design choices made in this game have made it a clear winner for me, and has been put on my favorites list. I can readily endorse this game to any gamer.